- New house with 180 m2, 50 meters from the beach, sea view, swimming pool with 30 thousand liters (7x3,5x1,4). Very cozy for those who want comfort near the beach. 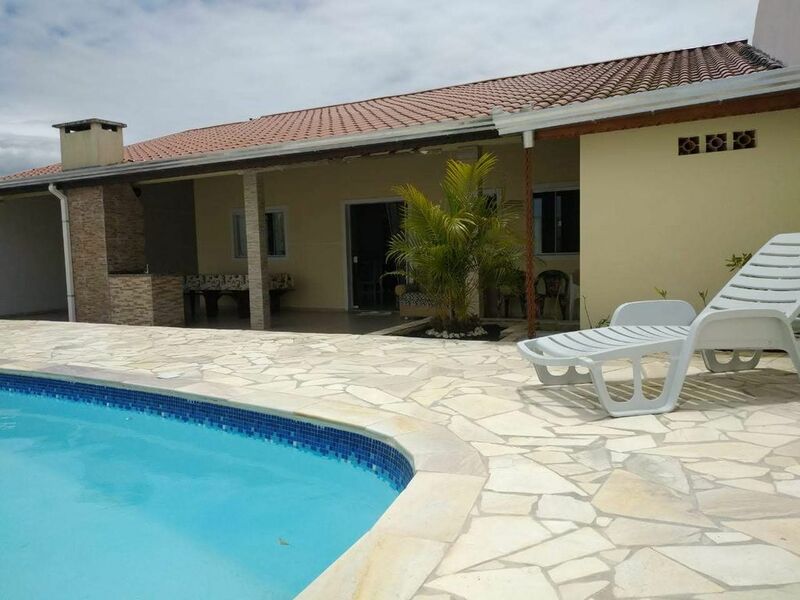 - The house has 3 bedrooms being a suite, social BWC, combined living / kitchen, ceiling fans in all rooms, airy, balconies in front and back, garage for up to 3 cars, complete barbecue to gather family and friends. - In the house you have: Wifi, Stove, Duplex refrigerator, Freezer, Microwave, Blender, Iron, flat screen TV, washing machine, centrifuge, 3 double beds, 1 single bed and extra mattresses for a total of 10 places, various household utensils: pans, pressure cooker, shapes, plates, cutlery, cups, glasses, etc..
- WE DO NOT PROVIDE bed linen, pillows, towels, napkins, floor cloths and cleaning and consumer materials. - The house sleeps 10 people between adults and children. - The house is next to the South Beach Condominium and in front of the Condominium Vilas Boas, in a privileged place. - Excellent location, next to the Boardwalk with sports activities (Football Field, Volleyball Court, Bocce Field and Kiosks). Next also to Supermarkets, Fruit and Vegetable Market, Restaurants, Ice Cream Parlors and Pharmacies. -OBS: Low Season Rates 450,00. - Weekends minimum 2 night. - New Year's Eve is already leased. As tarifas podem sofrer alteraçoes de acordo com a data soliciada, a quantidade de dias e a quantidade de pessoas.